Getting gauge and swatching, I am terrible at both! Nothing like proclaiming victory to tempt fate! It’s lovely, I hope your project continues to behave so nicely! Glad to hear! It is beautiful, no question about that! How amazing to be knitting yarn you made yourself, beautiful pattern, may it continue to go so well!! Looks squishy and beautiful. It seems you have reason to be crowing with contentment, but you sure are tempting fates by declaring that nothing could go wrong…. Hope everything continues to go as planned! We can probably live without the drama of rebellious yarn, and allow you a project that’s going well. I think you’ve deserved one. Hope you enjoy it anyway. Just what I was thinking– Stephanie deserves a drama-free project and a bit of pure good fortune! I hope you enjoy every second of your lovely yarn, Stephanie! Egads, no!! Do not even hint at that! You deserve all this goodness! The universe is paying you back for some of the bad stuff it threw at you. Stephanie, you deserve every bit of good fortune that comes your way! Enjoy it! I suddenly feel an urge to make some lace after looking at those beautiful photos. 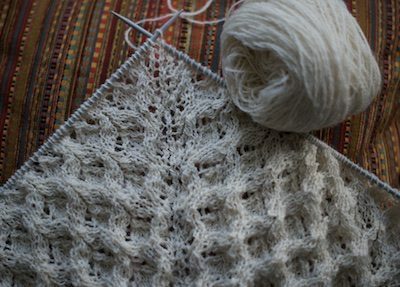 It’s kind of funny because I just reread your old post where you cast on the Nancy Bush Maralda shawl about a million times and laughed my head off yet again in sympathetic mirth. This might be the universe’s way of evening up the score. A project going swimmingly. What is that like? I have yet to really experience that. Oh, I’m pretty darn sure I was not the only one to start by scanning the comments for your name, Presbytera! =) No Rams yet… at least we all clearly know that Stephanie understands the gauntlet she has thrown down in front of, what is she called, the Knitting Muse? And yes, it IS possible to win such a challenge–which is why we humans keep attempting such madness!! Bwahahahaaaa…. I was thinking the same thing. Way to blow smoke in the knitting goddess’ face, Harlot. You’re due for a good knit? My only advice at this point is to be careful with your glass of red wine near it. I’d been thinking coffee but precisely the same thing. Uh-oh. You’re tempting the Knitting Gods and Goddesses again. What could go wrong, you ask? Let’s see…Elliott with grape jam…Sam “borrows” it…red wine…Penny wants to play tug-of-war…coffee…that squirrel…permanent marker…the list is endless. You’d better go make an offering, light a candle, or something! That is really a nice bit of knitting there. hmmm? I wonder if I have some yarn that will fit as nicely!!! I shall have to go wading in the stash and wait to see what turns up! Oh dear I think I have something in mind but I wonder if it has the right feel to it. I’m going to have to swatch!!! Oh Ilove it! It’s so soft and cuddly and beautiful. But please don’t block it and make it all flat. I know blocking makes things look better, but all that squishyness(?) will disappear! It is possible to block gently, enough to smooth things out and open up the lace, but not so much as to remove all the squishiness. I once knit Evelyn Clark’s Swallowtail out of some springy red Jacobs sheep yarn I bought from a Canadian spinner, I forget her name. It was for my oldest sister, and I only had a few minutes to pin it out as the 3 sisters were about to go out for lunch. The middle sister helped me and we pinned it out quickly, no time to readjust the pins for a severe block out. As a result it was open enough to see the lace, but still springy. She wore it to dinner and has just loved it ever since. I’m sure the Harlot knows all about this sort of thing and will get it just right. Lace is just magic when it blocks out and the lace pattern opens up. Big thrill every time. Right now I am knitting a black bridal veil with a purple heart edging for a goth bride. I cant wait to see it blocked out. Colors at the bride’s request. It is beautiful, and there is somehow comfort and contentment offered in that stitch. Beautiful. You worked for this knit experience. Your dues are paid for this one. Clearly there’s some kind of special magic in this yarn and pattern combo! But I’m really hoping you didn’t just jinx yourself! I kept waiting for the “and then….” consider fate tempted. As for the retreat. I retire in 6.5 years – I plan to attend in 2026 – there had better be a retreat! Can you give us another update when you’ve changed colors once or twice? I really want to see that subtle ombré effect from the shades in the fleece. Take a look in Instagram. She posted a photo of two colors there. I hear the theme for Twilight Zone playing in the background. I have a question on gauge – maybe good for a blog post topic, or a chance for you to say “you can learn this in one of our retreats!”: how do you fix it when the gauge is correct for stitches but not rows, or vice versa? I really like the texture in the pattern and I can’t wait to see the change in color. A real showcase for your spinning. PS- Your non use of a lifeline paired with a comment that things are going swimmingly is kind of daring. I think a knitting project that is tink or frog free deserves its own post …(and a party! )..not just those problem children projects. Can’t wait to see this one unfold…. I wish I could come to Strung Along again this year. I had an amazing time and it was really transformative for me to have a vacation by myself after 20 years in a close relationship (still in it but some personal space is always good). I learned a bunch of stuff and gained confidence in myself as well as new skills. Looking good! Hope you didn’t jinx yourself. Glad you shared a picture of your WiP. Now we can Ahh..wing and Ohh..wing properly. I keep my fingers crossed, just in case. I hope you haven’t jinxed it! LOL It will be absolutely lovely in the yarn you spun. I love natural colours, even in commercially spun wool. And I mean wool. I love to knit with it, to watch the body it forms. It’s definitely different from acrylics. Not that I don’t use those too sometimes, but wool is my fave. I’m excited to see this shawl! OK, I am snapping my fingers (or possibly crossing them) and saying ‘tfu tfu tfu’ (or ‘po po po’) on your behalf to avert the evil eye and anything else out there … you might consider obtaining a horsehoe and nailing it somewhere (upsidedown please) … and avoiding the colour green for a bit. Oh and no pictures of birds in the house, and no peacock’s feathers, and if in 3 weeks or so you catch sight of the new moon through glass you should probably curtsey to it. Yes, my PhD did contain a chapter on women’s customs and practices, how did you guess? Clearly time for red wine and chocolate! This shawl looks absolutely delicious! I would love to be knitting a shawl as I sit and watch the first (and hopefully only!) serious snow of the season here on the wet coast of BC but alas my “one project at a time” rule, and my lengthy procrastination when it comes to casting off the neck (yes that and working in ends is all there is left to do) on the sweater I have re-knit for my grandson, is keeping me from starting a nice cozy shawl that would be ever so handy in the cold weather we have had lately. But as Stephanie said about her sock club: it’s her club and she can make and break the rules. So – it’s your knitting and you could break the rules if the situation warranted it. I just spit three times to protect you. You’re welcome. That is an incredibly gorgeous yarn and pattern! I always love your choices; you are such an artist. Seeing your work makes me want to use more white and natural dyes. That color really shows off the stitch pattern. Happy Valentines Day to you and yours. Thanks for all the posts. You are an awesome person. Aren’t you a Prince fan, Stephanie? According to my calendar, today is Family Day in Canada. Happy Family Day to you and yours! I predict that it will be beautiful! Thanks for checking in on us! I do not in any way want to put pressure on you or act entitled to your time, words, and pictures. 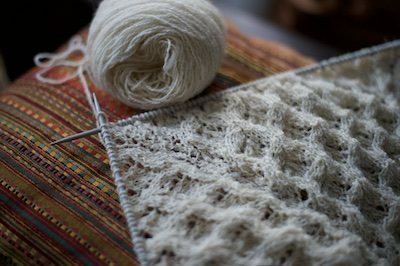 That said, if you do have the crack of an instant– I would LOVE to see the finished shawl and hear a bit about your thoughts (it looked gorgeous on Instagram!). I know this is not the place to post it, but I need an answer, please! I bought your so cute pattern Nouveau-Né and I just want to clarify something. Sweater: at rows 1 and 2, when I read that the 3rd row will be on the wrong side, is it ok? It means that the first row we knit is already on the wrong side ? Bonnet: when we knit the first 3 rows, we are now on right side for the 4th? it means that we begin the bee stitch at row 2 of the pattern, not with number 1? Is there a problem with the written pattern or it’s me who doesn’t understand?? ?